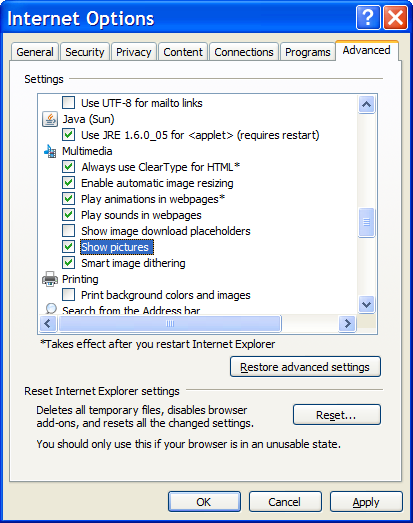 The ability to display pictures should be turned on by default, but IE7 still includes the option to turn it off. This is a browser-wide setting, so it'll effect every website you visit. Simply make sure that's checked, or not, as you see fit. "Another possibility is that your security software is somehow interfering with your web page displays." Sometimes files in IE's cache can interfere with new files and pictures. 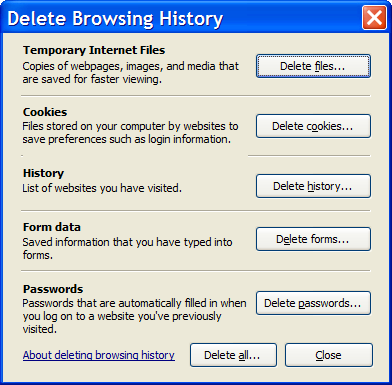 The quickest approach to eliminate this as a problem is to clear the cache. In the Temporary Internet Files section click on the Delete Files... button and then click on Yes in response to the confirmation request. Another possibility is that your security software is somehow interfering with your web page displays. Unfortunately there's no way for me to confirm that this is the case, because different security packages all operate differently and have different levels of what I'll just call "intrusion" into your browsing experience. If you're running a software firewall or some other kind of internet security suite, I would take a few moments to review whether or not that package is involved in protecting you from what your browser might display, and in turn, how to go about turning that off. This is also a case where "damn the consequences" might be an appropriate solution. In short, we're going to add the site you're having trouble with to Internet Explorer's list of "Trusted Sites". That should remove most of the restrictions that IE might be placing on that site's content. Enter the URL of the site that you're having issues with (you can see I've typed in "http://ask-leo.com" here as an example). You also may need to un-check "Require server verification (https:) for all sites in this zone" if the URL does not begin with https. 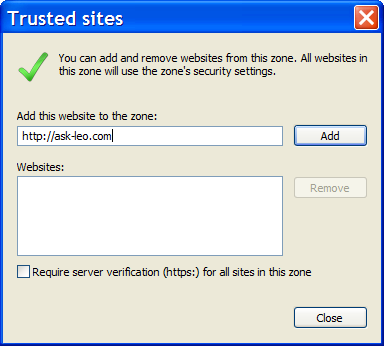 Since only sites you trust will be placed into this zone, it's reasonable to drop the restrictions placed on them. As it states "Appropriate for sites that you absolutely trust". And if you don't absolutely trust? Well, that's the "damn the consequences" part of it all. Why don't pictures show when I visit websites? There are many reasons why pictures don't show on websites. Some you can control, but others are problems with the websites themselves. The user should also make sure that he has downloaded the latest Java updates. One of my co-workers complained of being unable to view Google maps and various other web content. Problem was solved after downloading latest Java updates. Sometimes interactive buttons are not displayed. I am trying to purchase something and I can't find the "submit" buttions. Live Chat does not work. So simple to just check a box labeled "show pictures"...Thanks Leo. This is a great site. similar kind of problem i face. The pictures on the IE 7 browser are not clear it is hazzy. I have windows vista home premium on my toshiba u400 laptop. Plsd to know any solutions? images are not cear during the use of internet.how i can solve to this problem? Still .jpg images are not displaying in IE6. Scroll down and near the bottom, look for "Display Mixed Content"
I had a similar problem. Some web pages would not show and clicking on the picture on properties reported the picture as a Blank.Gif. I went into Manage-Add-ons in IE 9 & 10 and went to Tracking Protection and disabled all protection, closed IE and restarted. Problem went away and pictures were visible. Went back into Manage add-ons and into Tracking Protection and re-read all listings and re-enabled one at a time looking for the problem listing. I now use a personal listing based on what I want blocked. Hope this helps someone, I have been trying to find a solution to this for the past 6 months.